Visiting the Fairy Penguins at Phillip Island gives you a rare glimpse into the world of these adorable birds. A must-do tour from Melbourne! You get to watch them by the hundreds up close on their return from their day out fishing to their sand-dune burrows. These Little Penguins are for many people one of the first things they want to visit around Melbourne. A unique experience! 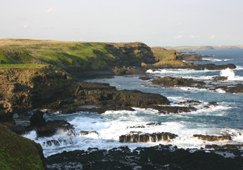 Phillip Island is a small semi-island that opens onto the Great Southern Ocean on one side, and onto a bay on the other. It is connected to the main land by road. You can witness the Penguin parade on the far Southwest end of the island at dusk. On our visit we watched them from a viewing platform that is restricted to a limited number of people, and from where we could see the penguins really close up, at about 2m. It is quite a show! Sitting on the platform in the dunes at dusk, looking over the ocean, waiting in anticipation, not quite knowing what to expect. It is cold facing the Southern Ocean. Definitely bring a blanket or coat to make it comfortable. Finally we make out some movement. Out of the surf appears a swaying mass of light coloured birds, hundreds at a time. As they waddle closer we can make out individual ones, while new groups of fairy penguins are still emerging from the ocean. It is an unbelievable sight. Penguins are fantastic swimmers but it is quite a struggle for them to waddle across the sand dunes. Many pause, look around. Some older ones struggle, others squabble. It seemed like we are as much the viewers as being eyed by them. Lot of penguins come right by the platform. This show takes between 30-45 minutes, in which time we see many hundreds if not thousands of penguins. You then get to walk along with them, or rather on boardwalks above them, and watch them toddle and squawk to find their burrows in the dunes. Tell us Your story of your visit of the Little Penguins! Needless to say, we loved it. Fairy Penguins, Tourist Attraction or Conservation? The parade of the Fairy Penguins is one of the major Melbourne tourist attractions and can attract thousands of visitors per day. After a day exploring the quiet and stunning Phillip Island it can be quite a surprise to come up to a full blown tourist facility. There are car parks, busses and crowds of people. You queue for a drink, and can loose your kids in the shop stuffed with soft toy penguins and memorabilia. But even with all that, it is tastefully organised. If you get there early enough, you can study penguin habits and behaviour in their education area. Nevertheless, I wondered about the penguins amidst such a show of people. But by the end of the night, it is obvious that Phillip Island Nature Park is looking after penguin welfare first, and that they are doing a great job as a Little Penguin research and protection centre. Its primary purpose is to protect and promote awareness of Little Penguins (this is what they are called now more accurately. Their previous, but still common name is Fairy Penguins). The penguins seem undisturbed by the walkways and people. People are quiet and respectful, photography is not allowed and there are enough walkways to give you your individual penguin experience. 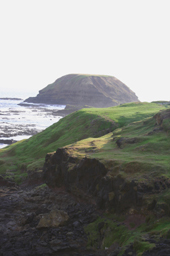 The Phillip Island Nature Park is a 2006 winner of the Victorian Tourism Award for Ecotourism. Phillip Island is located 140km southeast of Melbourne. The drive takes between 1 ½ and 2 hours, depending on traffic. You can drive yourself. If you have time, Phillip is a stunning island where you can easily spend a weekend. There are various tours to the Penguin Parade , such as a day trip to Phillip Island that includes other attractions as well, or a night tour exclusively to the Penguin Parade. There is a limit to the number of nightly visitors. During popular times such as school holidays it gets booked out. You can visit the penguin parade also as part of the Melbourne Sightseeing and Attraction Pass. They have attractive options for locals and short term visitors. We upgraded to the viewing platform that is restricted to a smaller number of people and that is much closer to the main penguin route than the main platform. I would recommend that upgrade. There is also a Sky box experience for 10 people per night, who can stay warm and watch the penguins from a pole. However, anyone can get close to them on the boardwalk, so you will not miss out either way. The Little Penguins are the smallest penguin species in the world and only 33cm tall. Little Penguins can sleep at sea. They can stay at sea for weeks. Their waterproof feathers keep their skin absolutely dry while diving for fish. Penguins swim 15 to 20 kilometres a day searching for small fish. A Little Penguin has been recorded diving to 65 metres! Little Penguins dark feathers are not black but a deep, rich blue. Their colour camouflages them from above and below the surface of the ocean. Natural hazards for penguins are sharks, birds of prey, rough weather and fish shortages. Their main threat to survival is human plastic rubbish and oils spills. 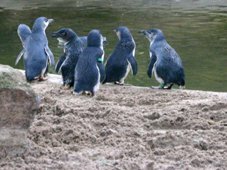 Phillip Island Nature Park is a self-funding organisation dedicated to protecting Little Penguins and other wildlife and their habitats on Phillip Island. One of the things you will see are knit penguin sweaters that are made by volunteers to keep them warm after being affected by oil spills.